New Rochelle, NY, March 6, 2018–When older adults suffer a traumatic brain injury (TBI), they may benefit from aggressive treatment and rehabilitation, but the lack of evidence-based, geriatric-specific TBI guidelines presents barriers to optimal care. The urgent need for more clinical research, data, and prognostic models on TBI in the growing geriatric population is described in an article published in Journal of Neurotrauma, a peer-reviewed journal from Mary Ann Liebert, Inc., publishers. The article is available free on the Journal of Neurotrauma website until April 6, 2018. In the article entitled "Geriatric Traumatic Brain Injury: Epidemiology, Outcomes, Knowledge Gaps, and Future Directions," Raquel Gardner, MD, University of California, San Francisco and San Francisco VA Medical Center, and coauthors from UCSF, Icahn School of Medicine at Mount Sinai (New York, NY) and Zuckerberg San Francisco General Hospital review the medical literature on TBI sustained by adults 50 years of age or older. The researchers report on the prevalence and incidence of TBI in this population, what the initial clinical evaluation and array of diagnostic studies should look like, and issues related to neurocritical care and neurosurgical management. In addition, the article addresses the controversial issue of how age affects outcomes and the risks of death, post-traumatic neurological disorders, and chronic psychosocial and cognitive impairment. The role of rehabilitation and future directions for research are additional topics of discussion. 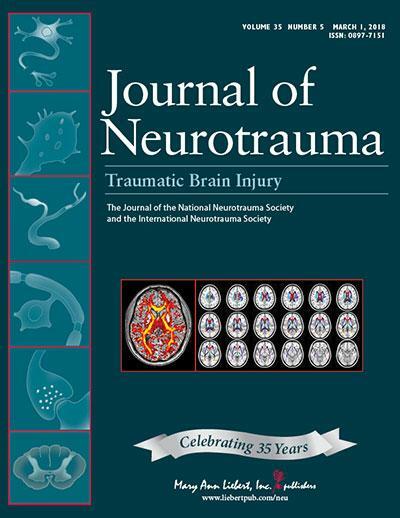 "The Journal is pleased to have the opportunity to publish this timely review that focuses attention on the significant problem of geriatric traumatic brain injury," says John Povlishock, PhD, Editor-in-Chief of Journal of Neurotrauma. "This important review is a must read for both basic and clinical scientists, confirming the gravity of this problem for our geriatric population, while highlighting a series of recommendations to improve the development of prognostic models and evidence-based management guidelines."